10 dos and don’ts of web design you must know when you make a website. The quality of your site’s web design can pretty much determine if your online business will be a success or failure. However, it is pretty difficult to determine which ideas will lead to a negative result, and which will do the opposite when you make a website. A lot of the time its trial and error. 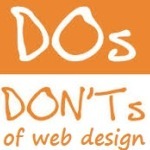 This article on the 10 dos and don’ts of web design will help you build a better website. If you are inexperienced, then you might have a hard time communicating with the web specialists you are working with, so it is always a nice idea to have a backup plan. In this case, we are here to offer you the best backup plan – a collection of the most important dos and don’t of web design. Keep on reading to find which things are mandatory for your website, and which things you should avoid all costs! There isn’t a perfect formula for the perfect website design. Some people appreciate certain features, while others will pay more attention to more unpopular design elements. So what can you do in this situation? The best idea is to go for a simpler design – a well-crafted website design will appeal to all your visitors. Come up with an easy-to-use and flexible layout, keep the design simple, use premium themes that are responsive, and make sure to get feedback in order to keep improving your ideas. The navigation menu on your website is one of the most important elements. It must be simple & small, but it should give your visitors quick access to the most important areas on your website. Apart from usability, you must take care of design as well. Choose between a vertical or horizontal navigation system, or maybe be creative and try to come up with a way to combine both systems. Your options are limitless, but don’t forget that a well-crafted navigation menu can compensate for just about any other flaw. Browser compatibility used to be an incredibly thing to achieve in the past, but today the job is a little bit easier. Use browsershots to check your design in hundreds of different browsers. There are countless of web design tools like imcreator and pre-made scripts that can help you make your website’s design compatible with the most popular browsers at the moment. Improving user experience is your main task! Don’t forget that this is a never-ending process and you’ll always see new ways to improve the experience of everyone who visits your website. For example, one important thing you should consider is the fonts you are going to use on your website. Try to use more common fonts, and try to use as less font types as possible. Don’t use all capitals in headings. It takes more time to read text that consists of only capitals. Besides, using all capitals is the online equivalent of shouting. This will keep your site simple, readable and enjoyable to browse. Nobody wants to visit a website just to see that the offers, news and information there are outdated. Leaving a good first impression is important, so make sure that everything on your website is up to date. This will leave a good first impression in the eyes of the people who visit your website for the first type. If you create a website using WordPress make sure you keep WordPress and the plugins updated. Regularly check for broken links, products, contact information and other details in order to make sure that they aren’t outdated. Flash is a very outdated technology. Flash is bad for SEO, it takes way too many resources, it isn’t attractive, and in most cases it leaves a bad first impression. There isn’t much to say about flash – just avoid it. Many websites that sell services or products will unpleasantly surprise you with a talking person as soon as you open their website. This is just horrible, and a terrible way to promote your products or services. It doesn’t look professional at all, so just don’t do it. If you rely on advertisements to generate profit, then make sure to show your ads in a way that won’t disturb your visitors. Pop ups were quite popular in the past, but let’s be honest – they always were a terrible way to promote something. Nowadays people use pop-up blockers and similar software that aims to get rid of these nagging advertisements. Avoid these ads and we guarantee that your visitors will be a little bit happier when visiting your website. Although the Internet technology is quite advanced, there are still people with a slower Internet speed or with a poorly performing device. However, this doesn’t mean that you have to use large images on your website. They take way too long to load, and in many cases your visitors will leave because of this unnecessary non-optimized design element. Today you can find a lot of tools to optimize images. If you find an image attractive, then compress it or reduce its resolution in order to improve your website’s performance. Never add automatically played sound files to your websites.